reading cannot represent the row of letters precisely. think your poems are boring, if speaking frankly. never made pieces being aware of entertainment, or pleasure. The reason is that to appeal to feelings is not my purpose. criticism is only based on pleasure for feelings. because it reduced the ranking of logic to a lower level. huge pleasure that we almost forget their logicalness. logical row of letters is enough to be a poem. [Q5] Who are the readers of your poems? my poems' reader should be "pure reason." Monogatari" and the poetics both analytic and unique. Takahashi "Jai" Tetsuo for the performance, "JIYAI-Kagura,"
Jaiken-Daiko (drumming)" based on the same rule (algorithm). show (see the info below). Taken by himself. - Nakazawa Hideki Exhibition "Sentence"  Apr 3 - 24, 2004. Gallery Cellar, Nagoya. Opening Reception: 5pm, Sat, Apr 3.
card and the further info can be seen at the above url. 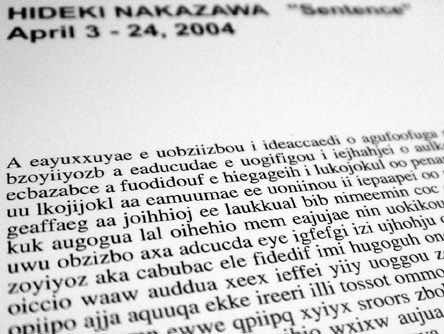 Performance: Nakazawa Hideki's "Coined Words Reading"
Lecture: Chiba Shigeo, art critic. Japan" (in Japanese and English) will soon be published. The exhibition at the MOT Annual 2004 has been done. 2. Further info will be announced later. "Striped Stripe"